Wraps could quite possibly be one of the best inventions. They are perfect pretty much anytime of the day and the possibilities of ingredient combos are endless. I am not a big fan of bacon (shocker I know – most people love it) but it just doesn’t do much for me. And no I am not big on breakfast sausage either – not my thing – I never crave it and don’t think I ever will. My low cravings for bacon and a veggie alternative led me in the direction of the A.L.T. 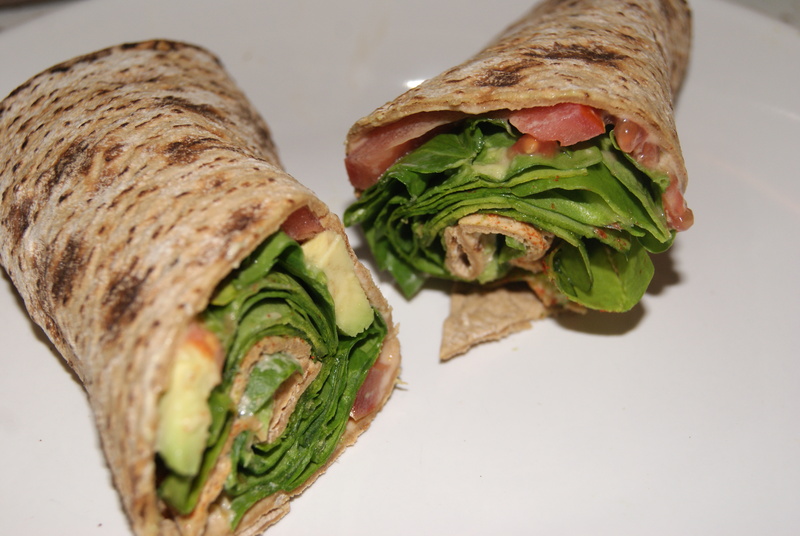 wrap – Avocado, Lettuce and Tomato and for times when you don’t have lettuce, spinach works great too (actually this one is with spinach – our secret). Super simple to make up and leaves you satisfied. Spread the hummus, top with the A.L.T. and sprinkle with Paprika. Wrap it up, cut it in half and enjoy.